Like most people, I take sides when I’m reading a book. I jump to conclusions about characters without enough evidence, second guess their decisions, root for the ones that seem to need it. Because that’s what makes reading fun! Good authors make it easy to pick and choose at first, then mix things up as the story progresses so that as a reader I have to change my previous assumptions as more facts come to light. 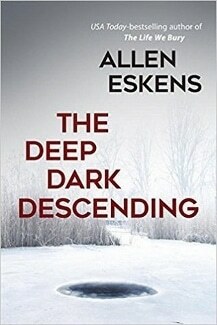 Allen Eskens is one such author. The Deep Dark Descending brings back one of the characters from The Heavens May Fall – Detective Max Rupert. I remember Max being the unreasonable cop aligned against our protagonist in that story, lawyer Boady Sandon. In The Deep Dark Descending we pick up at where Heavens ended, but now we’re in Max’s head, not Boady’s. A bold move, and one that pays off. I have to admit that I had a few misgivings about Max as Narrator (the story is told in the first person). Like I said, he didn’t win me over in Heavens. But that’s the beauty of these books – Max wasn’t a central character there. We heard about him, but not from him. The two stories are tied together for those who have read more than one, but absolutely stand alone for those who have not. And once we start hearing from Max, living with his demons, his character becomes full and complex and thoroughly engrossing. The Deep Dark Descending takes us with Max on his journey to find the person responsible for the hit and run death of his wife five years previous. He has always blamed himself – tortured himself – with the idea that her death was his fault, that it had something to do with his work as a detective. Now, thanks to Boady, he may actually be able to solve the cold case. The book takes us back and forth in time between searching for evidence and acting on that evidence, with the two timelines coming together as the events climax. The diverging timelines is another risky choice, and again Eskens nails it. He heads his chapters so we know which timeline we’re in (it’s also obvious from the text) and there is significant suspense in both. The most fascinating part is watching Max wrestle with his responsibilities as a detective and his relentless need to see justice done swiftly. In fact, though the plot is fast paced and interesting, it’s equally interesting to be in Max’s head as his demons battle it out for supremacy. Eskens also does a masterful job using the frigid Minnesota winter setting to maximum effect. Overall, I really liked The Deep Dark Descending. It’s a good thriller built around a very satisfying character study of a man making a series of choices that will change his life. If you haven’t read The Heavens May Fall, I recommend it as well, but don’t feel like you need to have read one in order to enjoy the other. Thanks to Cheryl and Seventh Street Books for sending me a review copy of The Deep Dark Descending.